Wrapping isn’t as difficult as you may first think. Every single carry that you wrap consists of a combination of 4 different passes. 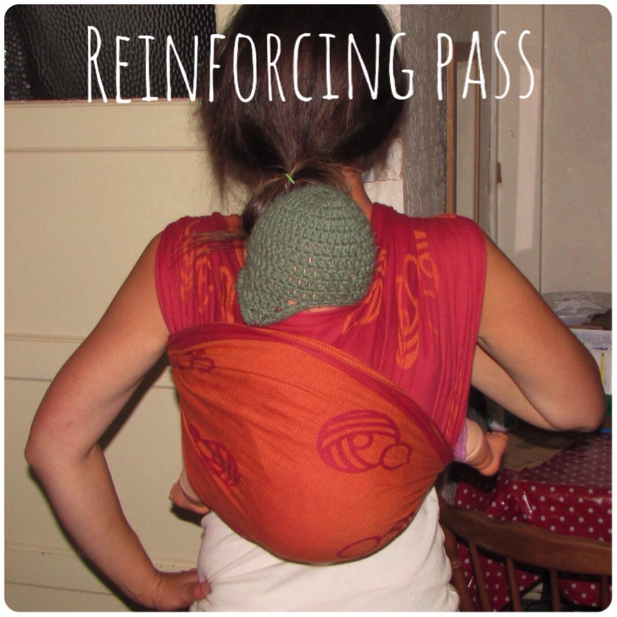 A pass is where you literally are passing the fabric from one side of your body to the other. Some carries may use a mixture of different passes; some may use the same passes. Sometimes these passes are spread out wide, and sometimes they are bunched. The wrap goes over the wrapper’s shoulder, across baby’s back and behind both of her knees, and over the wrapper’s other shoulder. Great for a high back carry. Can be cooler by allowing ventilation at the baby’s sides. Great for babies who lean. Not helpful for babies who leg straighten. The wrap goes over baby’s back on the diagonal, behind both of baby’s knees. One end goes under the wrapper’s arm and the other comes over the wrapper’s opposite shoulder. The wrap goes straight across baby’s back and under both of the wrapper’s arms. Bunched Horizontal Passes are also used in some carries. 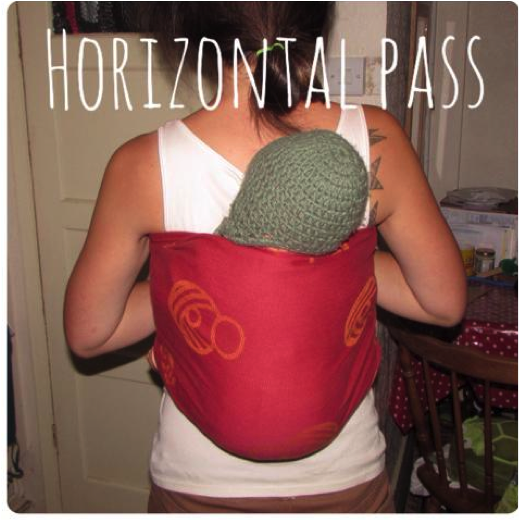 It is a horizontal pass that is bunched up into a roll instead of being spread over the baby. It goes under both of the wrapper’s arms, under the baby’s bottom, and over both of baby’s legs. Bunched torso passes help pin the seat, are very quick, and are cooler in the heat. They do not provide protection against leaning or leg straightening and do not offer additional support like a spread out torso pass. Used in Double Hammock Tied at Shoulder, Knotless Ruck, and Ruck Tied at Shoulder. 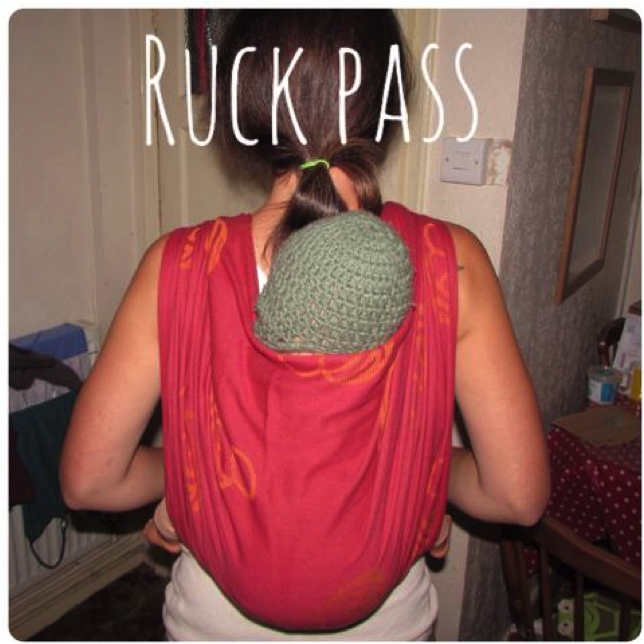 Great for securing baby tightly against wearer without any openings at the baby’s sides. Carries that start with a Torso Pass can only be as high as the wearer’s armpits which results in a lower carry. 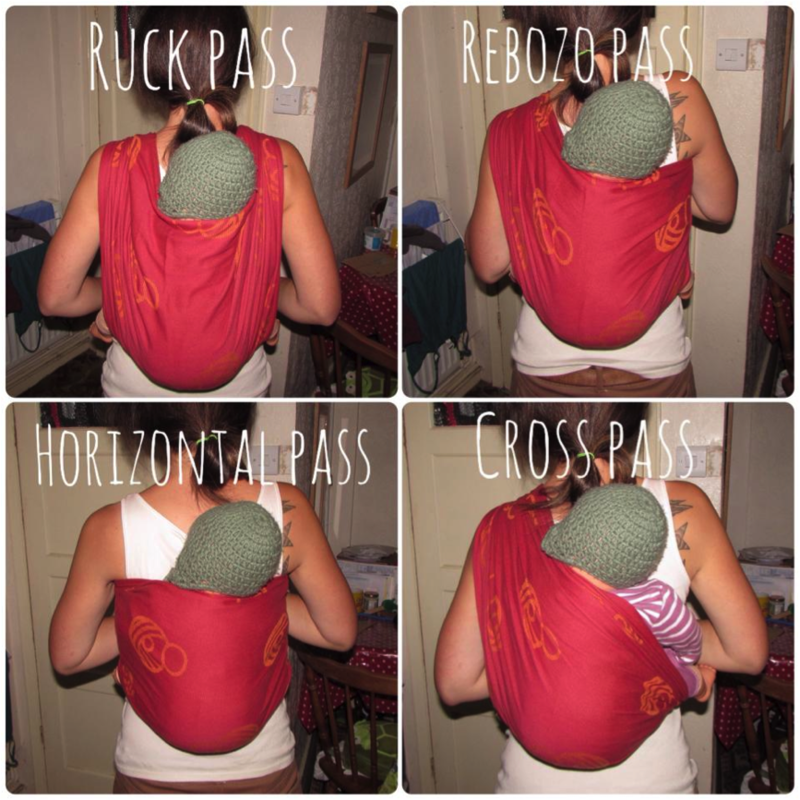 The wrap goes over the wrapper’s shoulder, across baby’s back diagonally, and under baby’s leg. If the wrap starts from under baby’s leg and travels diagonally up toward the wrapper’s shoulder, it is sometimes called a Wiggleproof Pass. Great for babies who leg straighten. 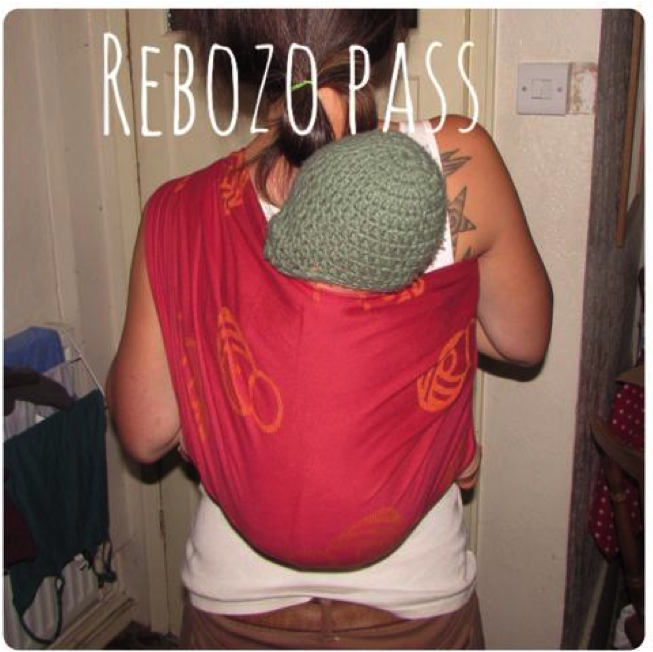 A cross pass can often be substituted for a Rebozo pass in carries where the wrapper desires protection for leg straightening. Not helpful for babies who lean. Not secure without additional passes. This isn’t technically a pass, as it does not offer support in the same way the first 4 do, it merely reinforces the existing passes. The wrap goes under the wrapper’s arm, across baby diagonally, and under baby’s leg. Can be bunched or spread. This pass is not suitable alone, but instead adds extra support or helps prevent leg straightening.a lower carry. Adds extra support when spread. Bunched reinforcing passes help pin the seat in place, are very quick, and cooler in the heat.